The sources of Belgian securities law are relatively widespread. In addition to the regulatory framework established at the level of the European Union,2 these sources include several federal acts and royal decrees, as well as specific regulations and guidelines issued by the Financial Services and Markets Authority (FSMA). The Act of 2 August 2002 on the supervision of the financial sector and on financial services (the Act of 2 August 2002). This Act sets out key principles in respect of (1) the regulation of the financial sector and the provision of financial services in Belgium; and (2) the structure and powers entrusted with the FSMA. The Act provides for (criminal) sanctions, inter alia, in respect of market abuse, insider dealing and market manipulation. The Act of 16 June 2006 on public offers of securities and the admission to trading of securities on regulated markets (the Prospectus Act). This Act implements the EU Directive 2003/71/EC (the Prospectus Directive, as amended by the EU Directive 2010/73/EU) into Belgian law.3 The Prospectus Act regulates the drawing up, approval and distribution of the prospectus to be published when securities are offered to the public or admitted to trading on a regulated market situated or operating in Belgium. The Act determines the scope of the FSMAs powers in respect of such public offerings or admissions to trading. The Act of 1 April 2007 on public takeover bids (the Public Takeover Bids Act), and the Royal Decrees of 27 April 2007. The Public Takeover Bids Act and the Royal Decrees of 27 April 2007 implement the EU Directive 2004/25/EC on takeover bids into Belgian law. They establish the legal regime applicable in Belgium to voluntary public takeover bids, mandatory public takeover bids and public squeeze-out bids. The Act of 2 May 2007 on the disclosure of significant holdings in issuers whose securities are admitted to trading on a regulated market (the Transparency Act) and its implementing decree of 14 February 2008. The Transparency Act implements into Belgian law the EU Directive 2004/109/EC on the harmonisation of transparency requirements in relation to information about issuers whose securities are admitted to trading on a regulated market. The Transparency Act imposes, inter alia, specific notification obligations on shareholders, in the event of the acquisition or disposal of major holdings or proportions of voting rights in listed companies (when such holdings or proportions of voting rights exceed certain thresholds set out in the Act). Regulations and guidelines issued by the FSMA. The FSMA imposes certain obligations on issuers of securities, but also on credit institutions, investment firms, intermediaries and investment advisers. The FSMA also publishes guidelines4 and communications, setting out good practices to be followed by Belgian market players. the Act of 25 October 2016 on the access to the activity of investment services as well as the status and supervision of portfolio management companies and investment advisory companies. The main regulatory actor on the Belgian securities market is the FSMA, formerly known as the Banking, Finance and Insurance Commission. The FSMA is an autonomous public institution. The FSMA and the National Bank of Belgium supervise the Belgian financial sector. According to the new supervisory model that entered into force in April 2011, the main powers of the FSMA concern the following matters: the supervision of financial markets and listed companies, the enforcement of rules of conduct on the market, the supervision of financial products and the supervision of financial services providers. The main departments of the FSMA involved in the enforcement of statutory provisions (set out in Section I.i) are the Sanctions Committee and the Management Committee. The Market Court also has exclusive jurisdiction to act as the main forum in respect of all subjective claims8 made on the basis of the Public Takeover Bids Act (Article 41).9 Its decisions in this respect are rendered as first and last resort, and are only subject to limited judicial review on legal grounds by the Supreme Court of Belgium. Belgian commercial courts and Belgian courts of first instance (civil sections) have jurisdiction to handle civil liability claims initiated by investors, for example, on the basis of infringements of the Prospectus Act. Criminal sections of Belgian courts of first instance also have jurisdiction to handle criminal cases and to impose criminal sanctions, when such sanctions are provided for under the relevant statutes and regulations. The FSMA and Belgian courts (both criminal and civil or commercial) have been confronted with litigation relating to violations of the Prospectus Act (e.g., proceedings relating to incomplete, misleading or erroneous information contained in prospectuses). Public takeover bids relating to significant companies in the Belgian economic landscape have occasionally resulted in litigation, essentially between majority and minority shareholders. Several cases brought before the FSMA and criminal courts have involved market abuse. Among these cases, insider trading is relatively frequent (see Section III). Under Regulation 596/2014 on market abuse (market abuse regulation), which entered into force on 3 July 2016, certain issuers of securities must draw up a list of persons who have access to inside information and who are working for them under a contract of employment, or otherwise performing tasks through which they have access to inside information (such as advisers, accountants or credit rating agencies). The existence of these insider lists tends to prevent the occurrence of insider trading among such external advisers. Claims related to transparency obligations (including notification obligations) under the Transparency Act tend to remain relatively limited. Private enforcement proceedings11 may be initiated by the relevant issuer of securities; by individual investors (being natural persons or legal entities); or under certain circumstances, by individuals acting collectively in the framework of a class action within the meaning of the Belgian Code of Economic Law. In this section we will focus on prospectus liability claims, civil claims against the regulator and civil claims for which class actions are available. Individual investors may bring civil claims against an issuer of securities (in the context of a public offering of securities) or a bidder (in the context of a public takeover bid), in respect of losses incurred as a result of incomplete, erroneous or misleading information in the prospectus, respectively on the basis of the Prospectus Act or the Public Takeover Bids Act. The prospectus is considered under Belgian case law and among Belgian legal scholars as a fundamental legal document, on which investment decisions are supposed to be made.12 The accuracy of the information contained in the prospectus is, therefore, of crucial importance13 and may give rise to liability claims, if the information proves to be incomplete, erroneous or misleading. In this respect, the prospectus relating to a public offering of securities or to a public takeover bid must identify the natural or legal persons who are responsible for its content. This presumption is nevertheless rebuttable. The legal or natural persons liable for the content of the prospectus may, therefore, submit evidence that there is no causal relation between the information contained in the prospectus and the loss incurred by the said investor. The defendants may also demonstrate that the plaintiff did not suffer any damage or that the information contained in the prospectus is not false or misleading. In principle, even non-material prospectus deficiencies may lead to civil liability. However, in practice, if the deficiency is not material, the defendant should be able to demonstrate that the damage was not caused by the deficiency in question. Individual investors and issuers of securities may make civil liability claims against the FSMA or its staff, in respect of losses incurred as a result of an act or an omission by the FSMA or its staff. Under Article 68 of the Act of 2 August 2002, the FSMA and its members and employees may only be held liable towards third parties (including investors and issuers of securities) for their acts or omissions, if their acts or omissions constitute fraud or gross negligence. Mere negligence will therefore be insufficient for the FSMA (or its members and employees) to be held liable towards third parties, from a civil law perspective. This favourable legal regime limits liability claims against the FSMA. However, the constitutionality of this liability regime has not been tested in court. The main procedural features of each of the three types of civil securities claims mentioned in Section II.i are set out below. In the context of a public offering of securities, the investor seeking damages from the issuer of securities on the basis of the Prospectus Act may act before the relevant court of first instance (civil section) or the relevant commercial court, in accordance with the provisions of the Belgian Judicial Code. If there are pending criminal proceedings in respect of an alleged breach of the Prospectus Act, the plaintiff may also choose to initiate civil liability proceedings before the criminal court seized of the criminal proceedings. The statute of limitation for filing a claim in tort is five years (Article 2262 bis of the Belgian Civil Code). This five-year period of limitation starts when the plaintiff becomes aware of the damage incurred (or its aggravation) and the identity of the person or persons responsible for the damage. No specific procedural rules apply to prospectus liability under the Prospectus Act in this respect. The Brussels Court or Appeal has nevertheless held that the 15-day statute of limitation does not apply to civil liability proceedings.26 Most legal scholars seem to follow the same approach.27 The applicable statute of limitation should therefore be identical to civil liability claims under the Prospectus Act. In the context of a public offering of securities, the issuer of securities or the investor seeking damages from the FSMA on the basis of a breach of the regulators obligations may act before the court of first instance (civil section) of Brussels. In the context of a public takeover bid, civil liability claims against the FSMA based on the Public Takeover Bids Act are subject to the exclusive jurisdiction of the Market Court. The legal basis is identical to that for prospectus liability claims set out in Section II.i (Article 41 of the Public Takeover Bids Act). Class actions can only be initiated with the courts of first instance or, as the case may be, the commercial courts. Only the courts of Brussels have jurisdiction to handle class actions. The group of plaintiffs may either be organised as an opt-in class (meaning that each member must confirm his or her willingness to be part of the class) or an opt-out class (meaning that the class will comprise all members who have not expressly asked to be excluded from the class). The court seized of the class action must decide which mechanism is more suitable, on a case-by-case basis. As soon as the competent court has declared the suit to be admissible, any individual proceedings brought by a member of the class against the same defendant and relating to the same subject matter and cause of action are without object and any such new proceedings will be declared inadmissible. Class action proceedings, however, do not preclude a member of the class and the defendant from settling their dispute amicably. In principle, parties to civil liability proceedings – including public authorities, such as the FSMA – may decide to settle their claims at any time, by means of a settlement agreement, within the meaning of Article 2044 of the Belgian Civil Code. Such a settlement is not subject to judicial review. There are no specific rules governing attorneys’ fees in this respect. Attorneys’ fees remain subject to general principles of Belgian judicial law and to the rules established by the relevant Bar authorities. ‘No cure, no pay’ arrangements are strictly forbidden, by virtue of Article 446 ter of the Belgian Judicial Code. In the framework of a class action, as indicated above, the second phase (the cooling-off period) of the process is supposed to lead to a settlement between the parties. This settlement is subject to judicial review. The relevant court may refuse to approve the settlement if, among others, the compensation provided for in the settlement agreement is ‘manifestly unreasonable’. Rules governing attorneys’ fees for class actions are identical to those described above for prospectus claims and civil claims against the regulator. Depending on the contractual or non-contractual nature of the claim, the amount of damages that may be granted to the plaintiff may vary. In respect of contractual claims, the defendant’s obligation to indemnify the plaintiff is limited to the ‘foreseeable prejudice’ suffered by the plaintiff as a result of a violation of the relevant contractual obligation (pursuant to Article 1150 of the Belgian Civil Code). The prejudice itself must be foreseeable – regardless of the amount of damages that the defendant may have to pay eventually. In respect of non-contractual claims, the defendant must indemnify the plaintiff for the entirety of the damage incurred (pursuant to Articles 1382–1383 of the Belgian Civil Code). The main debate – under Belgian case law and among Belgian legal scholars – in respect of prospectus liability claims refers to the calculation of damages. This section will focus specifically on administrative and criminal forms of action applicable to infringements of the Prospectus Act, the Public Takeover Bids Act, the Market Abuse Regulation and the Act of 2 August 2002. The FSMA is entrusted, together with the National Bank of Belgium, with the supervision of the financial sector in Belgium. exercise broad investigation powers: for instance, the FSMA may require the disclosure of relevant documents or information; it may conduct on-site inspections of premises belonging to undertakings subject to its supervision; in this context, the FSMA may also require access to any IT systems operated by potential defendants. Finally, the FSMA may also impose administrative sanctions for violations of securities law: administrative fines and periodic penalty payments. These administrative measures and sanctions may equally apply to legal or natural persons. The above-mentioned infringements may also give rise to criminal proceedings, which are subject to the relevant criminal law provisions contained in the Prospectus Act, the Public Takeover Bids Act and the Act of 2 August 200234 and also to general criminal law principles (contained in the Belgian Criminal Law Code and in the Belgian Code of Criminal Procedure). b the FSMA may also intervene in any pending criminal proceedings to ascertain that criminal sanctions provided for under the relevant provisions of the Prospectus Act, the Public Takeovers Bids Act and the Act of 2 August 2002 are properly applied to the relevant breaches (Article 124 of the Act of 2 August 2002). This subsection will focus on the salient features of administrative proceedings before the FSMA. 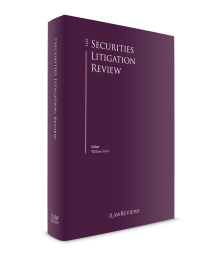 Criminal prosecution of securities-related enforcement actions is subject to general principles of criminal procedure (no specific rules apply in this respect). In accordance with Article 70 of the Act of 2 August 2002, the Management Committee of the FSMA is entrusted with the discretionary power to launch an investigation in respect of breaches that may be subject to administrative sanctions – either on the basis of findings made by the FSMA itself, or on the basis of complaints filed by third parties. The Management Committee appoints an auditor for the purpose of the investigation. In this process, the auditor may exercise the investigation powers referred to in Section III.i. The auditor must act with due regard for the rights of defence (Article 70(1) bis of the Act of 2 August 2002). Upon completion of the investigation, the auditor draws up a report, which is then submitted to the parties involved (including the defendant). The parties may comment upon the draft investigation report within a period of one month and, as the case may be, request further investigation as to the subject matter of the report. The final version of the report is submitted to the Management Committee. In accordance with Article 71 of the Act of 2 August 2002, the Management Committee must decide on the basis of the auditor’s investigation report whether: (1) to launch formal proceedings against the defendant by referring the case to the Sanctions Committee; (2) to close the file (without further action); or (3) to enter into a settlement agreement with the defendant (see Section III.iii). The decision to refer the case to the Sanctions Committee is notified to the defendant and to the Sanctions Committee. The Sanctions Committee must preserve the defendant’s rights of defence, by means of an adversarial (inter partes) procedure. In principle, the defendant is entitled to a two-month window within which to present any objections he or she may have in respect of the above-mentioned notification and investigation report (Article 72 of the Act of 2 August 2002). Previously, the fact that administrative sanctions have been imposed by the FSMA on a defendant did not preclude criminal authorities from imposing further (criminal) sanctions on the defendant. The criminal authorities nevertheless had to take into account previous (final) administrative sanctions and settlements when imposing additional fines on the defendant (former Article 73 of the Act of 2 August 2002). This situation cast doubt as to the conformity of the Belgian dual-sanction system with the non bis in idem principle, which is guaranteed under the EU Charter of Fundamental Rights and the European Convention on Human Rights. Belgian legal scholars regularly raised this issue, in light of the recent case law of the European Court of Human Rights (ECHR).38 The ECHR had the opportunity to rule in a market abuse case on the conformity of the Italian dual-sanction system with the non bis in idem principle. The ECHR ruled that this principle had been violated in the case at hand.39 The dispute concerned the implementation of administrative sanctions, in addition to criminal proceedings, for the same market abuse infringement. According to the ECHR, the administrative sanctions imposed by the Consob (i.e., the public authority responsible for regulating the Italian financial markets) were to be considered as criminal sanctions40 and thus came within the scope of the non bis in idem principle. As Italy not only imposed administrative sanctions on the applicants, but also initiated criminal proceedings against them (for the same infringement), the non bis in idem principle had been violated. The non bis in idem principle received a different interpretation in a recent decision of the ECHR41 where the court ruled on the conformity of the Norwegian dual sanction system and concluded that the non bis in idem principle had not been violated in the case at hand. The dispute concerned two taxpayers who claimed that they had been punished twice (in administrative and criminal proceedings) for the same offence. They alleged that they had to pay tax penalties following a decision of the tax authorities and had thereafter been convicted in criminal proceedings. The Court ruled that, while the tax payers had been sanctioned by two authorities through two different proceedings, there had nevertheless been a sufficiently close connection between the procedures (in substance and in time) to be regarded as forming part of an overall scheme of sanctions under Norwegian law. In order to comply with the case law of the ECHR, the Belgian legislator modified Article 73 of the Act of 2 August 2002, which now provides that the FSMA and the College of Public Prosecutors can enter into a protocol governing the working agreements (between the FSMA and the Public Prosecutor’s Office) for cases for which the legislation provides for the possibility of administrative and criminal sanctions. The aim of the protocol is to set up a harmonised sentencing policy (between the FSMA and the Prosecutor’s Office) in order to respect the requirements of non bis in idem principle. In addition, Belgian legal scholars and practitioners have expressed doubts over the compliance by the FSMA with the due-process rights of the defendants (e.g., breach of the level-playing-field rules). Before notifying grievances to the Sanctions Committee (as described in Section III.ii), the Management Committee may enter into a settlement agreement with the defendant, provided that the defendant has agreed to cooperate with the FSMA in the investigation and that the defendant agrees with the proposed terms of settlement (Article 71(3) of the Act of 2 August 2002). Such settlements are not subject to judicial review. No specific rules apply in respect of attorneys’ fees (other than general rules mentioned in Section II). In accordance with Article 216 bis of the Belgian Code of Criminal Procedure, the Public Prosecutor may decide to enter into a settlement with the defendant, in respect of criminal offences referred to under the Prospectus Act, the Public Takeover Bids Act and the Act of 2 August 2002. The amount to be paid by the defendant must be proportional to the gravity of the offence and cannot exceed the maximum of the fine provided by law for the said offence. Such a settlement may be entered into even if criminal proceedings are already pending before the relevant criminal court. As of 29 February 2016, the Belgian legislator introduced a new procedure in Article 216 of the Belgian Code of Criminal Procedure (i.e., the prior admission of guilt or guilty plea). This procedure provides the option for the Public Prosecutor to offer the defendant a lesser sentence than the sentence the Public Prosecutor would request in court, on the condition that the defendant pleads guilty. In the event of agreement between the parties, the Public Prosecutor, the defendant and the defendant’s lawyer sign a document setting out the details of the agreement. This agreement is subject to judicial review. The court may either ratify or dismiss the agreement; in the latter case, the court will refer the case to a chamber with a different composition for the rendering of a judgment on the merits. The guilty-plea procedure can only be applied for offences for which the Public Prosecutor would request in court a sentence of five years’ imprisonment or less, and provided that the court seized (i.e., the court of first instance or the court of appeal) has not yet rendered a final decision. No specific rules apply in respect of attorneys’ fees (other than general rules mentioned in Section II). The Sanctions Committee may impose fines on the defendant, if the existence of the relevant breach is established. The range of applicable fines depends on the relevant legal provision (i.e., the Prospectus Act, the Public Takeover Bids Act or the Market Abuse Regulation). the impact of the breach on the retail investors’ interests. In practice, imprisonments related to violations of securities law are extremely rare in Belgium. Most cases result in the payment of fines or in a settlement (entered into in accordance with Article 216 bis of the Belgian Code of Criminal Procedure, as described in Section III.iii). It remains to be seen whether the newly introduced guilty-plea procedure will be frequently applied in the context of violations of securities law (Article 216 of the Belgian Code of Criminal Procedure, as described in Section III.iii). This section will focus on conflicts of jurisdiction within the European Union, in respect of claims made against issuers of securities. Pursuant to Article 4 of the Recast Brussels Regulation, an issuer of securities may therefore be sued before the courts of the Member State where its statutory seat, central administration or principal place of business is located. In addition, in matters relating to tort, proceedings may be brought in the place where the harmful event occurred or may occur (Article 7(2) of the Recast Brussels Regulation). In two judgments,47 the Court of Justice of the EU (ECJ) ruled on the question of a court’s jurisdiction in a dispute related to the distribution of a prospectus. In the first case at hand, a consumer domiciled in Austria invested through an Austrian bank in certificates issued by Barclays Bank (based in the United Kingdom). At the time of the issue of the certificates, Barclays Bank also distributed a base prospectus in Austria. Eventually, the sums invested were largely lost. The investor brought an action before Austrian courts seeking the payment of damages on the basis of liability of Barclays Bank. The Austrian court referred the case to the ECJ. The ECJ ruled that the liability of Barclays Bank relating to the distribution of the prospectus must be based on tort, within the meaning of Article 5(3) of EU Regulation 44/2001 (currently, Article 7(2) of the Recast Brussels Regulation), which grants jurisdiction to the court of the place where the loss occurred. The ECJ confirmed that the courts of the state where the investor is domiciled have jurisdiction on the basis of the place where the loss occurred, particularly when the damage alleged occurred directly in the investors bank account held with a bank established with the area of jurisdiction of those courts. The second case concerned the enforceability of a jurisdiction clause, within the meaning of Article 23 of EU Regulation 44/2001 (currently, Article 25 of the Recast Brussels Regulation) contained in a prospectus in a secondary market purchase. The ECJ ruled that a jurisdiction clause contained in a prospectus produced by a bond issuer concerning the issue of bonds may be relied on against a third party who acquired those bonds from a financial intermediary if it is established that (1) the clause is valid in the relationship between the issuer and the financial intermediary, (2) the third party, by acquiring those bonds on the secondary market, succeeded to the financial intermediary’s rights and obligations attached to those bonds under the applicable national law, and (3) the third party had the opportunity to acquaint himself or herself with the prospectus containing that clause. Before it was dismantled in 2008, Fortis was a major banking, insurance and asset management group, based essentially in the Benelux countries. In 2007, Fortis suffered heavy financial difficulties following its joint acquisition of ABN AMRO (which involved two other major actors, namely RBS and Santander). In the midst of the global financial crisis of 2007–2008, Fortis progressively collapsed. Following a massive bailout by the Belgian and Dutch governments, the Belgian banking activities of the group were sold to BNP Paribas. This situation resulted in intense litigation before Belgian courts, involving the Fortis group, several of its directors, the Belgian government and a large number of minority shareholders, whose shares had lost most of their value. These minority shareholders claim, inter alia, that the information provided by Fortis (between the acquisition of ABN AMRO and the group’s demise in 2008) was misleading. Consequently, criminal, administrative and civil proceedings have been initiated. The administrative proceedings were closed in 2015, with fines imposed by the Brussels Court of Appeal on Ageas SA and two of the ex-directors. No substantial progress was made in the criminal proceedings during 2017. In the civil proceedings, on the other hand, some developments occurred. The criminal proceedings in the Fortis case are still pending. In October 2013, the Public Prosecutor’s Office announced that these criminal proceedings are unlikely to be completed before 2018. In a judgment dated 20 January 2016, the Brussels Court of First Instance ruled that an investor’s duty of investigation does not imply that the investor must always consult the prospectus or the executive summary, or both. According to the court, investors may base their decision whether to invest solely on the information published in the advertising made available to them, insofar as (1) there are no grounds for the investor to doubt the accuracy of the information contained therein, and (2) the investor understands all communications contained therein. The second judgment was rendered by the Brussels Commercial Court on 1 February 2016. The Court ruled in this case that forecasts published in a prospectus that subsequently prove to be incorrect shall not give rise to liability on the part of the issuer unless (1) they do not correspond with the internal estimates of the issuer, or (2) they are based on assumptions that are clearly unreasonable and are made without the required degree of professionalism. In a decision dated 18 May 2016, the Brussels Court of Appeal53 ruled on the appeal against the decision of 25 February 2015 of the Sanctions Committee imposing administrative fines to two natural persons for insider dealing. The first person worked for a communication agency specialising in financial publications for companies, where he had access to information relating to listed companies (which had not been made public). The investigation revealed that this person regularly purchased shares of companies that were clients of the communication agency, and this shortly before the publication by the agency of a press release from these companies. Each purchase transaction of the first person was followed by a purchase transaction by the second person for the same shares. Both persons knew each other well. Only the first person lodged an appeal against the decision of the Sanctions Committee. The Court convicted the first person for insider dealing, disclosure of inside information to the second person and participation in an agreement with the purpose to commit acts of insider dealing. The Court confirmed the administrative fine of €75,000 imposed by the Sanctions Committee. However, the Court considered that in view of the breach of the reasonable time requirement and the disproportionate effects that a nominative publication of the decision would have (harm to reputation and financial consequences), it was not appropriate to order its nominative publication on the website of the FSMA. There are currently no publicly available statistics concerning criminal proceedings in the field of financial law. However, such proceedings are relatively rare and are usually avoided by means of a settlement with the Public Prosecutors Office (see Section III). The Acts of 27 June 2017 and 31 July 2017 further aligned Belgian law with the Market Abuse Regulation (596/2014), which has been directly applicable in Belgium since 3 July 2016, and implemented the Directive on criminal sanctions for market abuse (2014/57). The Act of 21 November 2017 implemented Directive 2014/65/EU on markets in financial instruments (MiFID II). Important changes are to be expected in the field of (EU) prospectus law. The Prospectus Regulation (2017/1129) came into force on 20 July 2017. The Regulation lays down new requirements for the drawing up, approval and distribution of the prospectus. Apart from few specific provisions, which are immediately applicable, most of the provisions of the Regulation will enter into force on 21 July 2019. The Regulation replaces and repeals the Prospectus Directive. The prospectus regime has been redesigned to improve access to capital markets for companies (particularly SMEs) by reducing the administrative burdens and costs relating thereto. 1 Grégoire Jakhian is a partner and Olga Matiychuk is an associate at Loyens & Loeff, and Mathias Lamberty is an administrator at the Court of Justice of the European Union. The authors wish to thank Jens De Winne, an associate at Loyens & Loeff, for his assistance in producing this updated chapter. 2 See Section VI in this respect. 3 On 30 June 2017, Regulation 2017/1129 on the prospectus to be published when securities are offered to the public or admitted to trading on a regulated market, and repealing Directive 2003/71, was published in the Official Journal of the European Union. It remains to be seen to what extent the Act of 16 June 2006 will be amended following the entry into force of this Regulation (see Section VI). 4 These are often legally non-binding, but binding in practice. 5 As of 9 January 2017, the Market Court took over the areas of competence of the Brussels Court of Appeal in the field of securities law. 6 In the event of a violation of a disclosure duty (under the Transparency Act), an action may also be brought in the form of summary proceedings before the president of the relevant commercial court, on the basis of Article 516 of the Belgian Companies Code. The president of the commercial court may take certain measures under this provision, including the suspension of the voting rights attached to the relevant securities. 7 Taton, Les recours juridictionnels en matière de régulation (Brussels: Larder, 2010), pp 100–101; and Taton, ‘Les nouvelles procédures de sanctions devant la FSMA et la BNB’, Droit bancaire et financier (2012), p. 105. 8 Subjective litigation relates to individual rights that a given party may invoke on the basis of legal or regulatory provisions – as opposed to objective litigation, in the framework of which the objective validity of a statute or an administrative decision is challenged, on the basis of superior sources of law. 9 See Section II regarding civil liability claims made on the basis of the Public Takeover Bids Act. Private enforcement actions relating to other subjective rights will not be covered in this chapter. 10 One of the ‘Big Four’ audit companies has been facing criminal liability proceedings in its capacity as former statutory auditor to the Belgian company Lernout & Hauspie. The founders of Lernout & Hauspie were accused of fraud, in the aftermath of the firms bankruptcy. The Ghent Court of Appeal decided in 2010 that the statutory auditor was not to be held criminally liable, owing to a lack of satisfactory evidence. An employee of the statutory auditor, who was in charge of auditing the accounts of Lernout & Hauspie, has been condemned to pay a fine for his professional misconduct, even though the Court of Appeal acknowledged that he did not act wilfully. The Supreme Court of Belgium subsequently confirmed the judgment rendered by the Ghent Court of Appeal. In 2017, the Ghent Court of Appeal rejected the civil liability proceedings initiated in Belgium by the former shareholders of Lernout & Hauspie against the statutory auditor. The civil liability proceedings against the founders are still ongoing. 11 For a discussion of the appeal proceedings available to issuers of securities and third parties (including investors) against administrative measures and sanctions taken by the FSMA, see Section III. 12 Brussels Court of Appeal, 19 January 2006, unpublished. 13 Bruyneel, ‘Les prospectus financiers: quelques réflexions’, Mélanges John Kirkpatrick (Brussels: Bruylant, 2004), pp. 111–116. 14 ESMA Report, ‘Comparison of liability regimes in Member States in relation to the Prospectus Directive’ (ESMA/2013/619 Ann III, 30 May 2013), p. 14. 15 Fyon, ‘Quelques réflexions sur 1’évolution de la responsabilité quasi-délictuelle en matière de prospectus’, in Synthèses de droit hancaire et financier: Liber amicorum André Bruyneel (Brussels: Bruylant, 2008), pp. 403–428; and Dotremont and Velge, ‘Securities Law in Belgium’, in Best and Soulier, eds, International Securities Law Handbook (World Law Group, 2010), pp. 61–88. 16 Foriers (et al. ), Les offres publiques d’acquisition – le nouveau régime (Brussels: Larder, 2008), p. 293; and Vandendriessche, ‘Fraud-on-the-market: een causaliteitstheorie inzake beleggingsverliezen’, Tijdschrifi voor Privaatrecht (2011), pp. 277–308. 17 In the Prospectus Act, there is a specific additional requirement: this presumption mechanism may apply only if the relevant information was likely to have a material impact on the market. 18 Byttebier, Handboekfusies en overnames (Antwerp: Intersentia, 2012), pp. 541–543. 19 Dieux, ‘Examen de jurisprudence - droit financier (1990–2003)’, Revue critique de jurisprudence beige (2004), p. 262. 20 The scope of the class-action mechanism is limited in two ways. First, class actions are only available to consumers who are in dispute with an undertaking (i.e., ‘C2B’ litigation). Secondly, class actions can only be initiated for a limited number of claims, namely claims regarding the breach by an undertaking of either one of its contractual obligations or the European or Belgian legislation explicitly referred to in the Belgian Code of Economic Law. Regarding the latter, the Belgian Code of Economic Law refers among others to Articles 25(5), 27(2)–(3), 28 ter, 30 bis, 39(3) and 86 bis of the Act of 2 August 2002 (Article XVII.37). 21 For an overview of the claims that may fall within the scope of the class-action mechanism, see Renier and Toussaint, ‘L’action en réparation collective appliquée aux produits bancaires, financiers et d’assurances’, Droit bancaire et financier (Belgian Financial Forum, 2015), pp. 170–176. 22 Constitutional Court, 17 March 2016, No. 41/2016. 23 Foriers (et al.) (footnote 15), pp. 332–333; and Malherbe (et al. ), Précis de droit des sociétés – droit européen, droit belge (Brussels: Bruylant, 2011), pp. 1180–1181. 24 Foriers (et al.) (footnote 15), pp. 332–333; and Malherbe (et al. ), Précis de droit des sociétés – droit européen, droit belge (Brussels: Bruylant, 2011), pp. 1180–1181. 25 Collier, ‘Contentieux des OPA: recevabilité de l’action individuelle’, Revue de droit commercial belge, 2010, pp. 1005–1007. 26 Brussels Court of Appeal, 10 February 2006, Droit bancaire et financier (2006), p. 224. 27 Fyon, ‘Deux nouveaux jalons dans l’élaboration de la jurisprudence de la Cour d’appel de Bruxelles en matière d’offres publiques d’acquisition’, Droit bancaire et financier (2006), p. 238; and Foriers (et al.) (footnote 15), pp. 334–334. 28 Constitutional Court, 17 March 2016, No. 41/2016. The Court ruled that this requirement for official recognition violates Article 16(2) of the EU Services Directive 2006/123/EC, according to which Member States may not restrict the freedom to provide services in the case of a provider established in another Member State by imposing an obligation on the provider to obtain an authorisation from the competent authorities of the Member States in which the provider wishes to provide services. The legislator still has to adapt the Belgian Code of Economic Law to reflect this case law. 29 For an overview of the different phases of the proceedings, see Renier and Toussaint, ‘L’action en réparation collective appliquée aux produits bancaires, financiers et d’assurances’, Droit bancaire et financier (Belgian Financial Forum, 2015), pp. 178–183. 30 Collier, ‘Information financière et lien de causalité’, in Les offres publiques et le prospectus (Brugge: Vanden Broele, 2007), p. 247. 31 Dieux (footnote 18), pp. 260–261; and Brussels Court of Appeals, 15 March 1991, TRV p. 258; and Brussels Court of Appeals, 3 October 2006, DAOR (2007), p. 221. 32 Estienne, ‘La perte d’une chance dans la jurisprudence récente de la Cour de cassation, Revue critique de jurisprudence belge (2013), pp. 605–624. 33 Respectively: Articles 67–72 of the Prospectus Act; Articles 35–40 of the Public Takeover Bids Act; Article 25 of the Act of 2 August 2002. 34 Respectively: Articles 69–70 of the Prospectus Act; Article 38 of the Public Takeovers Bids Act; Articles 39–43 of the Act of 2 August 2002. Articles 39 and 40 of the Act of 2 August 2002, which contain criminal sanctions for insider dealing and market manipulation, have been amended to implement Directive 2014/57/EU of 16 April 2014 on criminal sanctions for market abuse (market abuse directive). This Directive has been transposed by the Belgian state into national law by the Act of 31 July 2017. 35 A case of insider trading, which resulted in both administrative and criminal proceedings, involved the Belgian holding company, Compagnie du Bois Sauvage. Compagnie du Bois Sauvage and several of its directors were sued by the FSMA and the Public Prosecutors Office before the Brussels Criminal Court, following the sale of their shares in the Belgian bank Fortis in the midst of the financial crisis of 2008. These administrative and criminal proceedings came to an end through settlement agreements entered into between Compagnie du Bois Sauvage, the Public Prosecutors Office and the FSMA, in November 2013. 36 Taton (2012) (footnote 6), p. 88. 37 Further to an Act dated 2 July 2010, the power to impose periodic penalty payments belongs exclusively to the Management Committee of the FSMA. The Sanctions Committee may no longer impose such periodic penalties. 38 Foriers, ‘Les infractions spécifiques aux sociétés cotées’, in Criminal and Administrative Sanctions in Financial Matters seminar, Vanham & Vanham (24 March 2011), pp. 25–26; Taton (2012) (footnote 6), pp. 102–105; and Coenegrachts, ‘Bis repetita (non) placent’, Revue de jurisprudence de Liège, Mons et Bruxelles (2012), pp. 127–128; Morbee, ‘Cumulatie van administratieve en strafrechtelijke sancties in de bestrijding van marktmanipulatie: nieuwe rechtspraak van het EHRM’, TRV (2015), pp. 351–357; Andre-Dumont, ‘Les sanctions administratives dans la loi bancaire’, Droit bancaire et financier (Belgian Financial Forum, 2015), p. 109. 39 European Court of Human Rights, 4 March 2014, Grande Stevens and others v. Italy. See also: European Court of Human Rights, 10 February 2009, Sergey Zolotukhin v. Russia. 40 Regarding the administrative sanctions imposed by the FSMA Sanctions Committee, the Brussels Court of Appeal adopted a similar opinion: Brussels Court of Appeal, 19 June 2013, RW (2014–15), pp. 711–712. 41 European Court of Human Rights, 15 November 2016, A and B v. Norway. 42 As amended by the Act of 19 October 2015 reforming civil procedure (i.e., the ‘Potpourri I Act’). 43 Brussels Court of Appeal, 19 June 2013, RW (2014–15), pp. 711–712. 44 Constitutional Court, 2 June 2016, No. 83/2016. 45 In accordance with the Market Abuse Directive, Member States must, inter alia, ensure that infringements by natural persons of the prohibition of insider dealing and market manipulation are punishable by a maximum term of imprisonment of at least four years and the unlawful disclosure of inside information by a maximum term of imprisonment of at least two years. To date, however, no draft act implementing the Market Abuse Directive has been submitted to the Belgian parliament. 46 If the defendant’s domicile (within the meaning of the Recast Brussels Regulation) is not located on the territory of the EU, conflicts of jurisdiction before Belgian courts will be settled in accordance with the provisions of the Belgian Code of Private International Law. 47 ECJ, 28 March 2015, C-375/13, Kolassa/Barclays Bank and ECJ, 20 April 2016, C-366/13, Profit Investment Sim SpA (in liquidation)/Ossi. 49 FSMA, Annual Report 2016, pp. 82–83 (https://www.fsma.be/sites/default/files/public/sitecore/media%20library/Files/publications/ver/fr/fsma_ra2016_fr_web.pdf). 50 FSMA, Annual Report 2015, pp. 82–83. 52 Brussels Court of First Instance, 20 January 2016, Bank Fin.R. (2016), 166–171; Brussels Commercial Court, 1 February 2016, Bank Fin. R. (2016), 24–35. 53 FSMA, Annual Report 2016, pp. 85–86 (https://www.fsma.be/sites/default/files/public/content/EN/JVRA/fsma_ar2016_en.pdf).